Majdanek or KL Lublin was a Nazi German concentration and extermination camp established on the outskirts of the city of Lublin during the German occupation of Poland in World War II. Although initially purposed for forced labor rather than extermination, the camp was used to kill people on an industrial scale during Operation Reinhard, the German plan to murder all Jews within their own General Government territory of Poland. The camp, which operated from October 1, 1941 until July 22, 1944, was captured nearly intact, because the rapid advance of the Soviet Red Army during Operation Bagration prevented the SS from destroying most of its infrastructure, but also due to ineptitude of commandant Anton Thernes who failed in his task of removing incriminating evidence of war crimes. 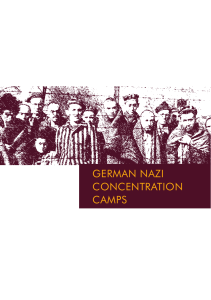 Therefore, Majdanek became the first concentration camp discovered by Allied forces. Also known to the SS as Konzentrationslager Lublin, Majdanek remains the best preserved Nazi concentration camp of the Holocaust.Unlike other similar camps in Nazi occupied Poland, Majdanek was not located in a remote rural location away from population centres, but within the boundaries of a major city (see also: Nisko Plan preceding the formation of the Ghetto). This proximity led the camp to be named Majdanek by local people in 1941 (""little Majdan"") because it was adjacent to the suburb of Majdan Tatarski in Lublin. The Nazi documents initially called the site a Prisoner of War Camp of the Waffen-SS in Lublin because of the way it was operated and funded. It was renamed by RSHA in Berlin as Konzentrationslager on April 9, 1943; however, the local Polish name is how it is remembered.